University of Chicago Medicine Chief of the Section for Trauma and Acute Care Surgery and Executive Vice President for Community Health Engagement Selwyn O. Rogers, Jr., MD, MPH; Meharry-Vanderbilt Alliance Executive Director Consuelo H. Wilkins, MD, MSCI; and 16th Surgeon General of the United States David Satcher, MD, PhD. NASHVILLE, Tenn. 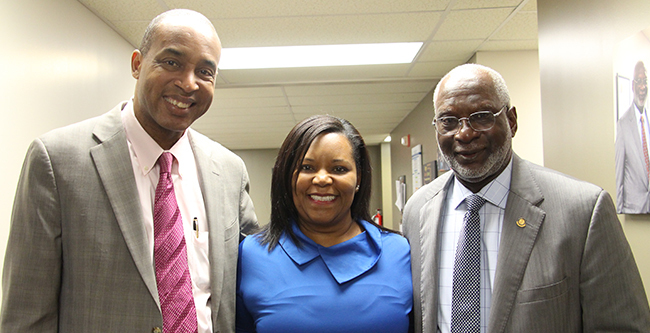 Examining violence as a public health issue was the focal point of a roundtable discussion with Selwyn O. Rogers, Jr., MD, MPH and David Satcher, MD, PhD at the Meharry-Vanderbilt Alliance (MVA) on September 6, 2018. Rogers serves as UC’s Chief of the Section for Trauma and Acute Care Surgery and Executive Vice President for Community Health Engagement. He is also the Founding Director of the Trauma Center, which he said quickly became one of the busiest medical centers of its kind. “We often see repeat patients,” he said, noting that violence tends to be an ongoing cycle. Community leaders and researchers gathered at the MVA for the discussion, which was made possible by Vanderbilt University’s (VU) Master of Public Health Program and the David Satcher Lecture of the Flexner Dean’s Lecture Series. It sought suggestions for breaking that cycle. MVA Executive Director Consuelo H. Wilkins, MD, MSCI, who fielded questions throughout the evening, opened the conversation by asking how communities can take ownership of social determinants that lead to violence. In order to make a positive impact on the issue, Rogers said he and others at the Trauma Center try to connect patients with continued care after they leave. “We hope to be a model for treating trauma patients better, with prevention as well as treatment,” he said. The current question, he added, was how people can be resilient in the midst of trauma. “If we can figure that out, we may have a way forward,” he said. Rogers’ clinical and research interests focus on the health care needs of underserved populations. He builds interdisciplinary teams to address health disparities and the societal factors that affect individuals and communities affected by violence. As a junior faculty member at Vanderbilt University (VU) and MMC, Rogers obtained his Master in Public Health Degree from Vanderbilt. He has 16 years of trauma care experience and is leading an initiative to expand trauma care in the South Side of Chicago. Satcher was a four-star admiral in the United States Public Health Service Commissioned Corp and served as the 10th Assistant Secretary for Health and the 16th Surgeon General of the United States. He is a former President at MMC and the Founding Director and Senior Advisor of the Satcher Health Leadership Institute.